Now you have an iron bloom. What do you do with it?? 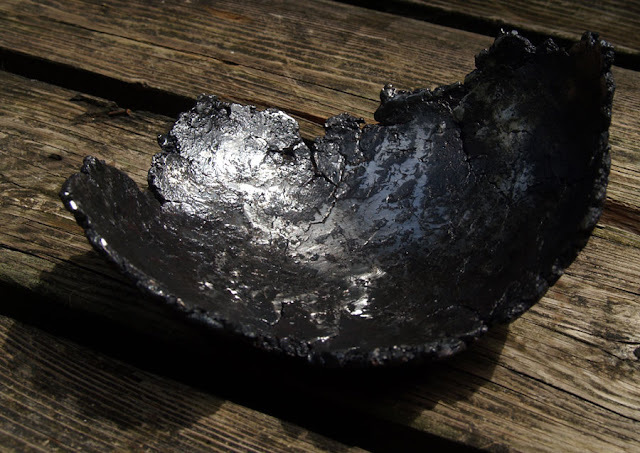 This is the most recent in a series of bowls forged from self made bloomery iron. 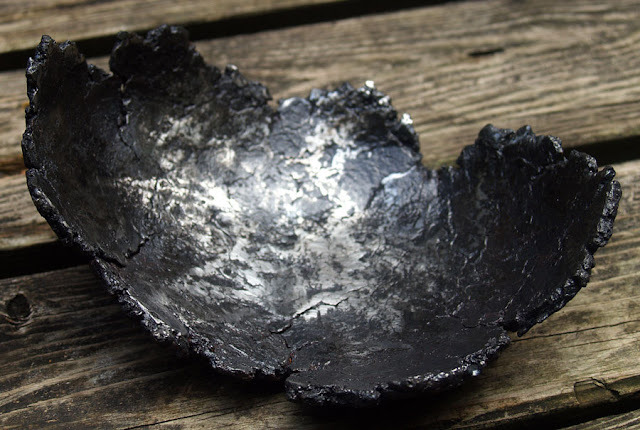 The source of the iron itself was from Smelt #24, conducted in June of 2007. The specific experiment was a 'hot swap' - a double use of the same furnace. Once this bloom was formed, and extracted, a second charge was added to the still hot furnace and a second bloom created. 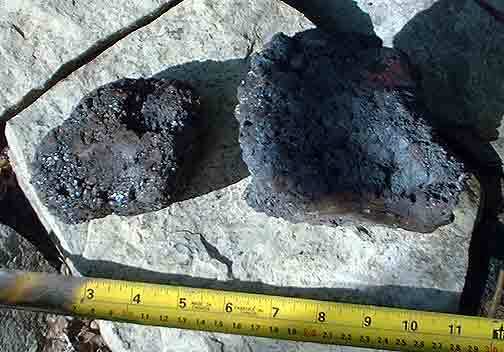 The description of these pair of smelting experiments can be found on the main Wareham Forge Experimental Iron Smelting web records. After initial compaction (right after extraction) the bloom from Smelt 24 weighed 860 gms. A spark test on the surface suggested the metal content was fairly low carbon - considerably less than the 0.20 % of modern mild steel. Considerable slag could be seen flowing to the outside surface at this step. • An additional series of welding heats were taken, using the hand hammer in an attempt to weld in the ragged edges, resulting in a rough rectangle. • Again at close to welding heat, the plate was returned to the hydraulic press, this time under a cylindrical 'drawing die'. At this point, the plate started to fragment along the edges, with several match box sized pieces working loose. The result of a compaction at welding heat (on the press) was a successful weld. • An additional series of welding steps with the hand hammer to ensure the edges were firmly attached. • Several forging heats under the air hammer to thin out the welded plate (starting at about 1/2 inch thick) down to roughly 3/16 thick. A mushroom head die (on a handle) was used for these steps. • A final set of forging heats using the 1 kg rounding hammer to smooth out any ripples from the die. Note that 'knowing how' is not a consideration here. Or the $2000 plus full week of work for the Hydraulic press - installed specifically for bloom work. Forging the bowl itself took about another 30 - 45 minutes. The next day there was polishing and finishing, about another 30 minutes. The completed object is 550 gm (so roughly a one third loss in its creation). The rough size is 6 inches long by 4 1/2 wide and standing 3 tall. How do you price an object like 'Bloom Bowl #4'? Railroad Spike Knives - WHY? COPYRIGHT NOTICE - All posted text and images @ Darrell Markewitz. No duplication, in whole or in part, is permitted without the author's expressed written permission.